William James P Warren was born in Yeovil in 1897, the son of china warehouseman Edward Warren (1869-1924) and Charlotte Ann née Hurlestone (b1871). In the 1901 census Edward and Charlotte were listed living at 3 South Street with their children; Florence (b1896), three-year old William, Ewart (b1899) and Gertrude (b1900) together with Charlotte's widower father, Stephen Hurlestone (1837-1903). Edward gave his occupation as 'Warehouse Man (China)'. Just a couple of years later, on 22 February 1906, the family home in South Street, just behind the Three Choughs Hotel, was burnt to the ground (see Gallery). By the time of the 1911 census the family were living at 145 Huish at which time the family had grown with another daughter, Ellen (b1906). Edward was working in a china shop as an assistant and 14-year old William was 'Learning for Reporter in a News Paper Office'. He was, in fact, working at the Western Gazette at their new offices on the corner of Newton Road. William was also a member of the Yeovil Volunteers and, by the time he enlisted, was a Section Commander. William enlisted at Yeovil, joining the 15th (County of London) Battalion, London Regiment (the Prince of Wales' Own Civil Service Rifles) as a Rifleman. His Service Number 533214 suggests that he enlisted around May 1916. He was most likely sent to France in October 1916 at which time his Battalion were fighting in the Battle of Le Transloy Ridges (1 to 18 October 1916) in France. The Battle of Le Transloy began in good weather and Le Sars was captured on 7 October. Pauses were made from 8–11 October due to rain and 13–18 October to allow time for a methodical bombardment, when it became clear that the German defence had recovered from earlier defeats. Haig consulted with the army commanders and on 17 October reduced the scope of operations by cancelling the Third Army plans and reducing the Reserve Army and Fourth Army attacks to limited operations in co-operation with the French Sixth Army. Another pause followed before operations resumed on 23 October on the northern flank of the Fourth Army, with a delay during more bad weather on the right flank of the Fourth Army and on the French Sixth Army front, until 5 November. Next day the Fourth Army ceased offensive operations except for small attacks intended to improve positions and divert German attention from attacks being made by the Reserve / Fifth Army. On 5 February 1917 William was wounded in the day-to-day fighting in the trenches and hospitalised at Boulogne, where he died from his wounds on 10 March. He was 20 years old. 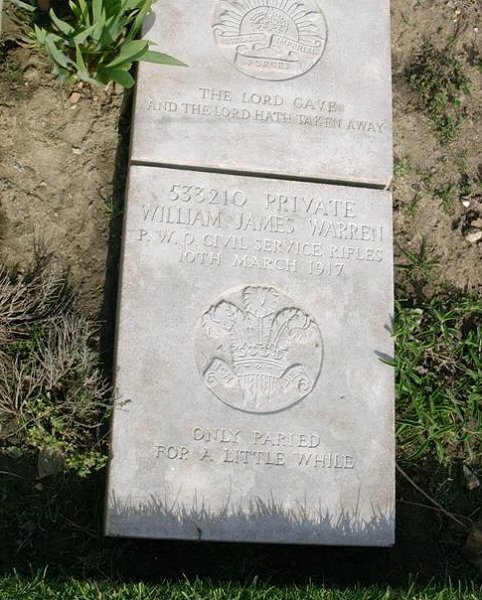 On 16 March 1917 the Western Gazette reported "Mr and Mrs Warren, of 32 King Street has been informed that their son, Private WJ Warren, London Regiment, died on Saturday at a base hospital from wounds received in action on February 5th. This news will be received with utmost regret by Private Warren’s many friends in the town, particularly in the Yeovil Volunteers, in which at the time of joining up, he had attained the rank of Section Commander. He was a popular and valued member of the Western Gazette Reporting Staff, and although only in his 21st year, by his conscientious and painstaking work was regarded as having a promising career ahead of him. He volunteered for service when he became of military age and joined a well-known unit of the London Regiment, which had seen much service in France. He had been in France about six months and had some very narrow escapes in the Somme battles. The utmost sympathy has been extended to Priv. Warren’s parents at the loss they have sustained. At the Wednesday night parade of the Yeovil Volunteers, the detachment stood at “the present” whilst the “Last Post” was sounded as a mark of respect to the memory of the deceased." 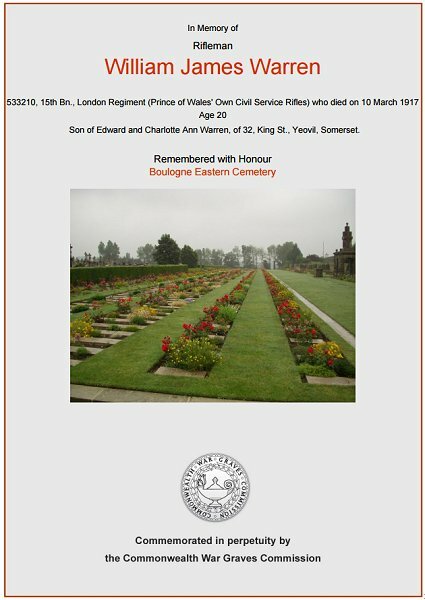 William was interred in Boulogne Eastern Cemetery - Grave VIII.A.188 and his name is inscribed on the roll within the memorial to the Prince Of Wales Own Civil Service Rifles (see Gallery) and is also on the War Memorial in the Borough. Other Yeovil men buried in Boulogne Eastern Cemetery include - Albert Bowden, Henry Hardy and Horace Heard. The ruins of two cottages destroyed by fire, on 22 February 1906; these were numbers 2 and 3 South Street. 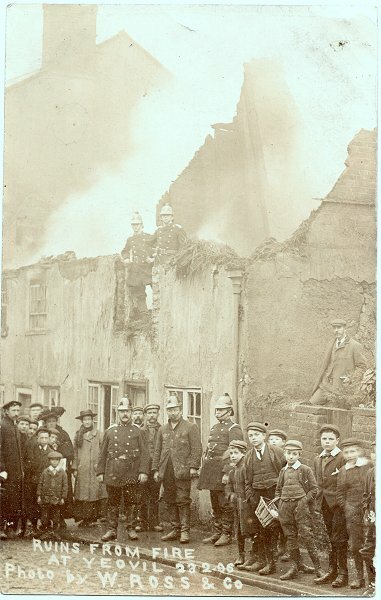 The two firemen are standing in the ruins of No 3, which was the home of the Warren family. This photograph is by William Ross and was produced as a postcard. The site of the burnt cottages is now the rear access yard of Argos. The Commonwealth War Graves Commission certificate in memory of William Warren. William's grave marker in Boulogne Eastern Cemetery.